Love & Laughter is where it’s at. These days, weeks seem to fly by. And the weekends seem to go even faster. There’s our jobs. There’s laundry and dinner and dishes and meal planning and grocery shopping. There’s a never ending list of things that have to be done outside. Let’s not forget about actually giving the kid some attention somewhere in all of that. Oh, and that guy called my husband…he’s kind of important too. I’m afraid to think about how fast everything will go when Rylee is in school and playing sports. And what about when we throw another kid into the mix!? I don’t even want to think about it. Sometimes it’s tough trying to find balance in it all. Friday night we went on a family date to a college basketball game to watch one of Andy’s former students play. There was popcorn! And dancing to watch at halftime! Saturday there was a big, hearty dinner of pork roast, mashed potatoes and fresh applesauce! Followed up by a little hubby-wife time spent watching Captain America. 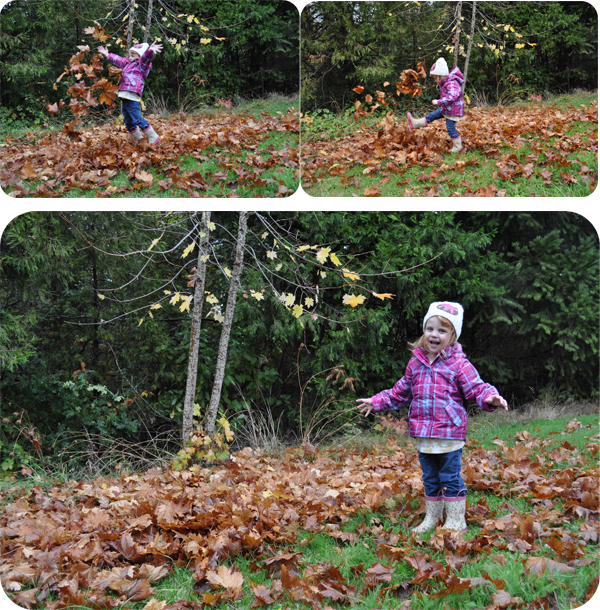 Sunday there was leaf kicking! Pond looking! Mud stomping! Apple Picking! Fall decorating! Banana muffin baking! There was a lot of time spent apart through the weekend. Like me going to a baby shower on Saturday and Andy working on fencing all day on Sunday. How do we balance it all? I have no idea, but we make it work. At the end of every day, our lives are so full of love and laughter. That’s all the balance we need. This entry was posted in Boots, Country Living, family, marriage on November 7, 2011 by katherine. Yeah… could Rylee be any cuter? I don't think so. I want these pictures for my fridge. Please?! If you upload them to Walgreens, I can go pick them up. They are adorable!